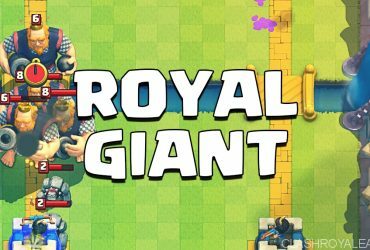 2v2 Giant Graveyard Cycle – Pressure and Punish! Hey guys! It’s NebulaNoodle here again with a unique new deck that has been working very well for me in 2v2s, a Giant Graveyard Cycle deck! This deck is really good at synergizing with common decks that your teammate might use. Hopefully, you will see why this deck is so good after reading my guide. I hope you enjoy! Why is this a 2v2 Deck? The reason why I put this as a 2v2 deck is that it synergizes very well with certain types of decks. I will go more in-depth on this later. Also, both Giant and Graveyard are extremely good 2v2 cards! The fast pace will keep your opponents on their toes. A very viable win condition in 2v2, and your secondary win condition. He is especially powerful considering he only costs 5 Elixir. This deck has really good synergies as I mentioned before, and Giant Graveyard Poison is just very cancerous! Giant in the sweet spot after you’ve taken a Tower+Graveyard is just as deadly as 3M in the sweet spot. Your main condition, as the Giant acts as a tank mostly as well as having the bonus of being a secondary win condition. just got Graveyard recently, so I toyed around and made this awesome deck. This card is extremely deadly, and even if the RNG is gone, it still works really well in the meta in my opinion. Your main support unit for Giant and pseudo Graveyard tank. 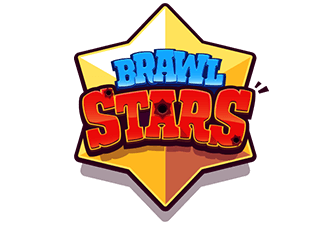 He clears ground swarms and air swarms alike as well as being tanky, which is incredibly strong for the cost of 4 Elixir. He has a great synergy with Tesla, which is the main defensive combo I use on this deck and even survives a Giant Skeleton bomb! One of the best Epics you can obtain from early arenas. Another support troop for Giant. The Minions can run up and distract an Inferno Tower, while the Princess Tower is locked on the Giant. The great thing about this deck is that if your opponents’ decks hard-counter the Graveyard, you can play this like a regular Giant deck. Remember you still have your teammate to support you and for you to support him! Perfect synergy with the two win conditions in this deck, and one of the best crowd control cards in the game, which is crucial for 2v2 battles as there will be more Elixir on the field meaning juicier positive Elixir trades! You could argue that Inferno Tower works but I need the cheap cycle and my teammate will have a solid defense as well, remember that. Cycle, distract, kill! Ice Spirit+Tesla does nicely vs. P.E.K.K.A, just drop Baby D/Minions on support and you’re good to go. Just watch for splash units, Poison them before they can build a good push. You may have wondered why I didn’t use Goblins – I wanted to keep the Elixir cost cheaper. Your saving grace vs. Spell Bait, try to over level your Zap, so it kills Stab Goblins (extremely helpful.) Use to reset Infernos onto another troop. First of all, don’t be a douche and leave the game after 10 seconds. Are you past that stage? If so, good! I can now get on to the juicy content. Best starting moves: Baby Dragon/Minions/Skeletons at the back. As you can see, this deck relies heavily on a good starting hand! In the early game, test the waters and see what your opponent has. Don’t play too passively because you have a quick cycle and solid defense if you have a really bad starting hand simply wait for your opponent to make the first move. It should be easier for you because you can get the early chance for an Elixir lead! With your teammate helping you, he can play his way, but stick to the plan! The best deck to synergize with this is a Miner deck. The cards just work so well on your deck. Sometimes you will have to follow your teammate- if he goes in with aggressive play, just support him minimally and don’t waste all your Elixir on the push as now both your opponents will just completely maul you with a massive push. If your teammate spends all his Elixir, leave him be and save your Elixir because your opponent might try to punish. In mid-game, start playing more aggressively. You might not need to use your Graveyard the whole game if your teammate has another sufficient win condition. Your playstyle depends on his deck archetype. 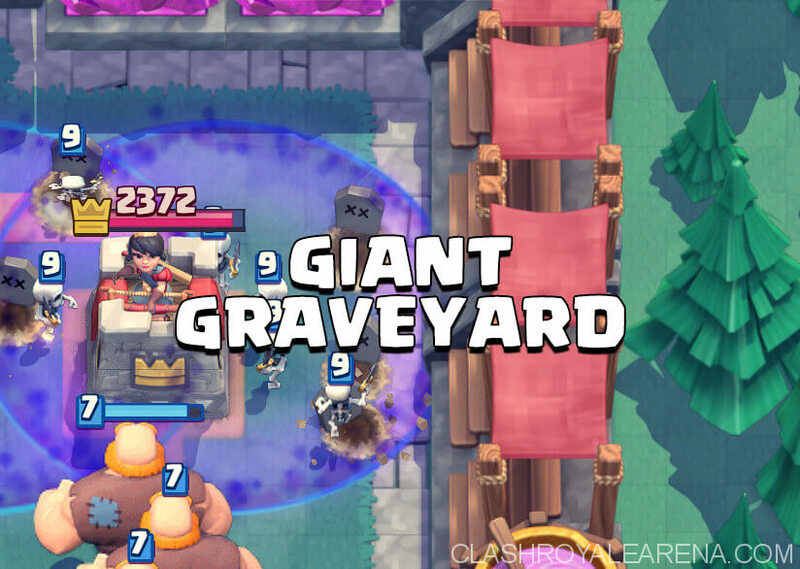 For example, if your teammate is playing Golem, you should be using your Graveyard the whole time and maybe even go in for a split push- you could rush Giant+Graveyard on the other side, which will catch your opponents off guard if they don’t have many elixirs on hand. But if your teammate is playing Hog Cycle, don’t always use your Graveyard, only when a big push is built up. Don’t worry too much about wasteful spells, because your opponent will likely have 2 or 3 spells. Just don’t be careless and think that it doesn’t matter, so you’re gonna Poison the Tower by itself. The most important thing is remembering to HOLD YOUR SPELLS SO YOU DON’T END UP BOTH LOGGING ONE GOBLIN BARREL! Remember to support your teammate as well as you can and remember not to play too aggressively as you have two opponents. In the late game, you should be cycling your Giants as quick as you can, but remember your opponents both are at Double Elixir too so don’t just spam cards thinking they won’t have the Elixir to defend. lay pretty much the same as you’ve been doing. You have your teammate, remember, but if you want to try this is 1v1, here are some tips. The air defense in this deck is OK. Put Tesla straight on from the Hound, and clean up the Balloon with Minions. Poison on the air swarms and everything! Lightning got a nerf, but there are still a crap ton of Golem decks running around. You shouldn’t worry TOO much. Tesla to pull Golem within two towers’ range. Worst case scenario you will need to use the Giant to distract the support. Baby Dragon and Minions work very well at killing the support. See Golem, but the Giant has less health. This might be a little hard, but if you have an overleveled Zap on the ladder you’re fine. Save Zap for the Barrel, but if there’s a chance for a good Zap value you can take a little damage and defend with the Baby Dragon, then go for the counterpush. 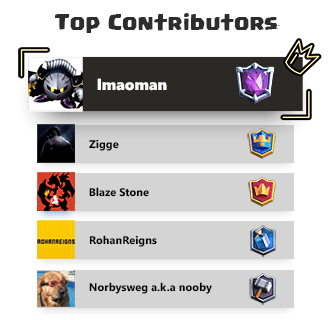 Distract the Inferno Tower with Minions, as these decks don’t usually have Arrows, but don’t always assume. raveyard+Poison kills all their Graveyard counters, and the Giant is also there too! Against Graveyard Cycle, try to keep up with the cycle as best you can! That’s the most important thing. Baby Dragon hard counters Graveyard, just watch for Freeze, but don’t panic and overcommit! Against Graveyard Beatdown, prioritize the Graveyard because that’s a much bigger threat. That being said, use your Tesla accordingly. 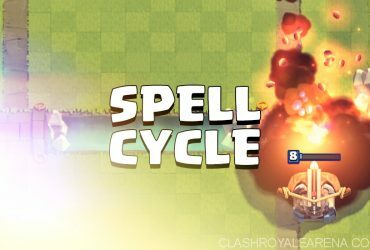 Against Hog Cycle, try to keep up with the cycle as best you can again. Don’t be too afraid to give up one or two Hog hits. They will inevitably have a building so place your Pre-Poison for the Giant. Sometimes you will have to decide on whether to support the Giant or the Graveyard with the Poison. Against Miner decks, you just need to fight on two fronts (Miner and Support.) Kill the support first with Minions/Baby Dragon/anything defensive. Against Mortar, use Giant to block and kill everything with Poison, and watch them cry. The only thing to watch out for is Rocket. Bait out their Arrows on your Minions. Against X-Bow, pretty much the same as Mortar. Just watch for Inferno Tower/Dragon. Against Elite Cancer, you don’t have a specific counter, so use Tesla accordingly and don’t overcommit. Cycle your Skeletons and Minions, that 4 Elixir combo alone works wonders against Elite Barbarians. This deck is really strong in 2v2 and synergizing with other decks, and does quite well in the ladder, but not so many challenges. Do give it a shot and tell me how you do. If you have any feedback tell me in the comments, whether positive or negative.